The waters of Rock Creek and the grass that grew along its banks provided a welcome oasis for travelers traversing the arid Snake River Plain. 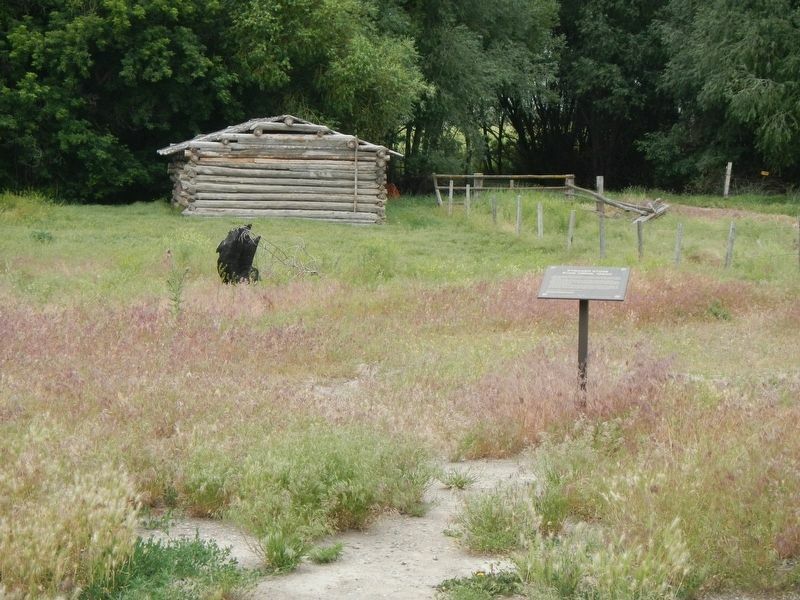 This combination caused the area to become a favorite camping site for Oregon Trail emigrants and a crossroads during the development of nineteenth century roads. 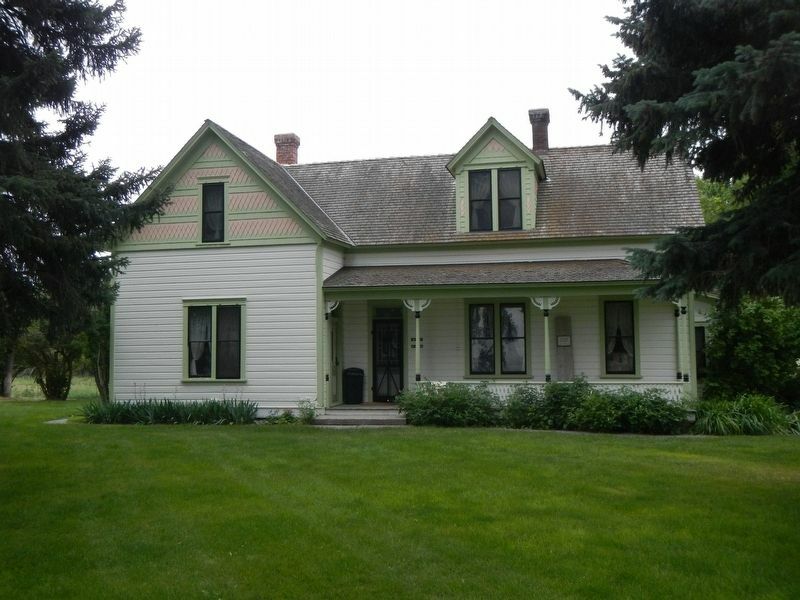 In 1864, Ben Holladay chose this site for a home station on his Overland State Line. The U.S. Army established Camp Reed near here in 1865 to protect travelers, and James Bascom built the Rock Creek Store. 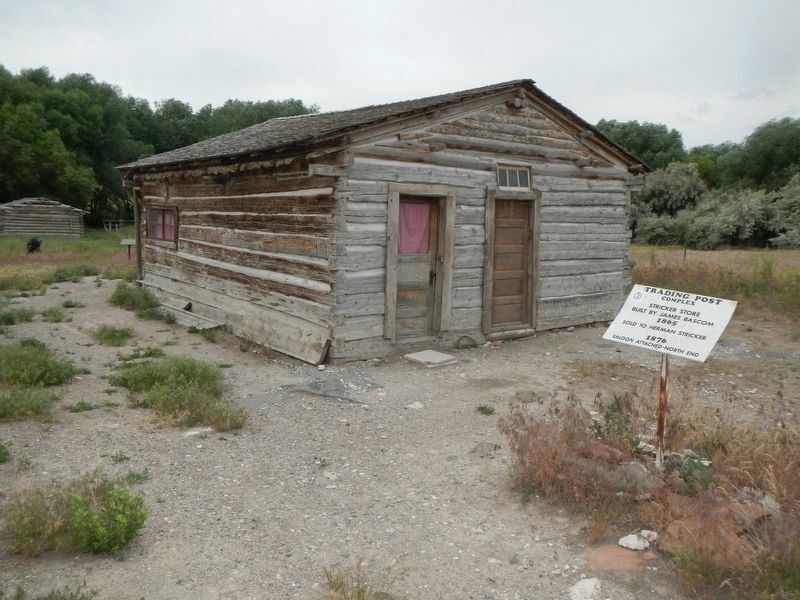 The store soon became a popular stopping place for emigrants, freighters, miners and cowboys. On August 31, 1888, Sarah Hall Pullman noted, "this Rock Creek Store is a great blessing to the emigrants.... So as they can get a Sack of flour for themselves, and something to feed their starving teams on...."
the house just east of the store in 1900. It replaced one destroyed by fire the previous year. A small cemetery nearby contains the graves of three emigrants. Erected by Oregon-California Trails Association. Location. 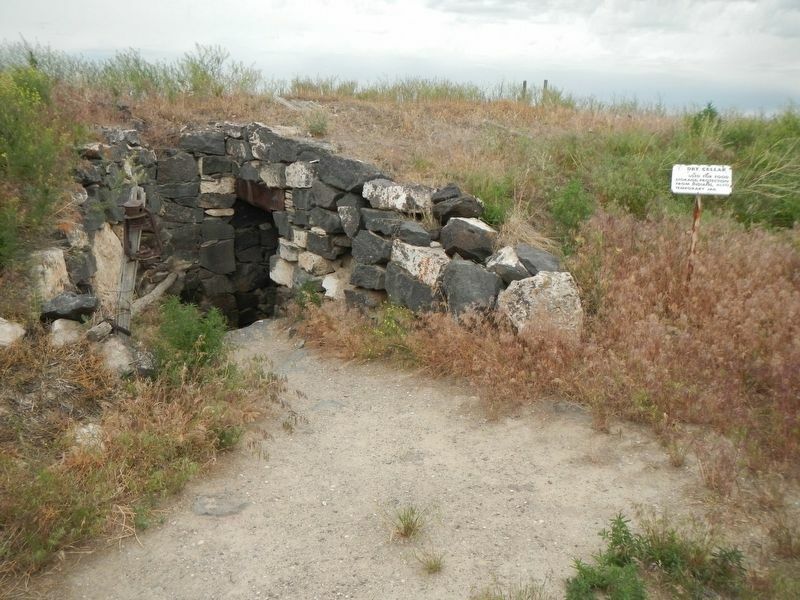 42° 27.628′ N, 114° 19.385′ W. Marker is near Hansen, Idaho, in Twin Falls County. Marker is at the intersection of Stricker Cabin Road and East 3200 North (Pumpland Road), on the right when traveling east on Stricker Cabin Road. Touch for map. 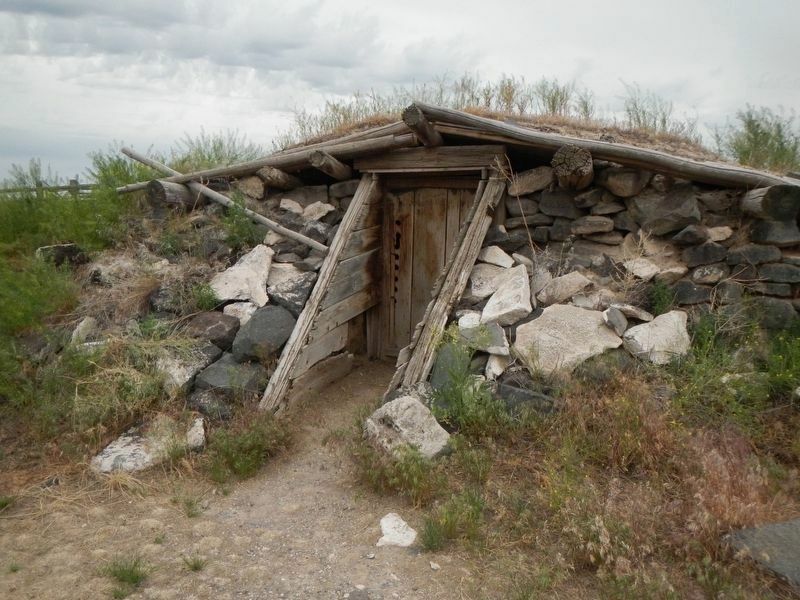 Marker is at or near this postal address: 3715 Stricker Cabin Road, Hansen ID 83334, United States of America. Touch for directions. Other nearby markers. At least 8 other markers are within 6 miles of this marker, measured as the crow flies. 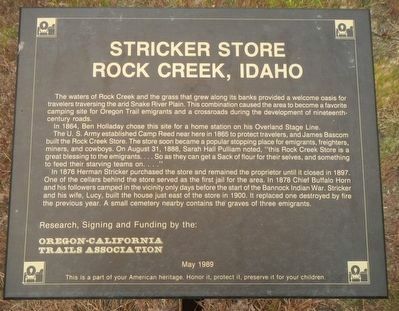 Rock Creek Station (a few steps from this marker); Old Rock Creek (within shouting distance of this marker); Rock Creek (within shouting distance of this marker); Stricker House (about 400 feet away, measured in a direct line); a different marker also named Stricker House (about 400 feet away); First Trading Post (approx. 5.1 miles away); Hansen (approx. 5.1 miles away); a different marker also named Rock Creek Station (approx. 5.1 miles away). Touch for a list and map of all markers in Hansen. More. Search the internet for Stricker Store. Credits. This page was last revised on October 25, 2018. This page originally submitted on October 25, 2018, by Barry Swackhamer of San Jose, California. This page has been viewed 40 times since then and 7 times this year. Photos: 1, 2, 3, 4, 5, 6. submitted on October 25, 2018, by Barry Swackhamer of San Jose, California.